1000 Mess-Free Aluminum CD DVD Storage Case Holder Box Black W Removable Trolley Free Shipping 9mm Single High Quality DVD case [AC1000NBT] - $99.99 : MegaDiscStore, Your choices of High quality CD DVD Blu-Ray Replace cases! New Generation Mess-Free Media Disc Storage case, safe store and prevent discs mess up when you carry it. Large aluminum case for carry or store Max. 1000 CD or DVDs. Keep your discs safe and secure inside. Has two key locks for security and comes with a set of 2 keys. Chrome metal corner and extra strip reinforce the case more solid and durable. (Mostly Aluminum DVD Cases in the market are use Chrome Plastic Corner, they are looks like metal, but they are plastic, very easy to be broken when the case dropped, when the corner broken, the whole case will be useless). Quarter round durable Aluminum construct, 2 hinges,2 chrome locks, 2 spring controlled chrome solid metal handles installed at both side of the case. Allow customers to keep 152 Pcs of standard CD Jewel cases or 300 Pcs (Estimate) of slim CD jewel cases as well. Contain 3 Solid dividers and 4 position adjustable Stoppers, the middle divider is fixed and the rest can be removed. Store CD DVD Blu-Ray and Software discs with their Plastic Sleeves, Paper Sleeves, Opp Sleeves, Keepers and CD Jewel cases. 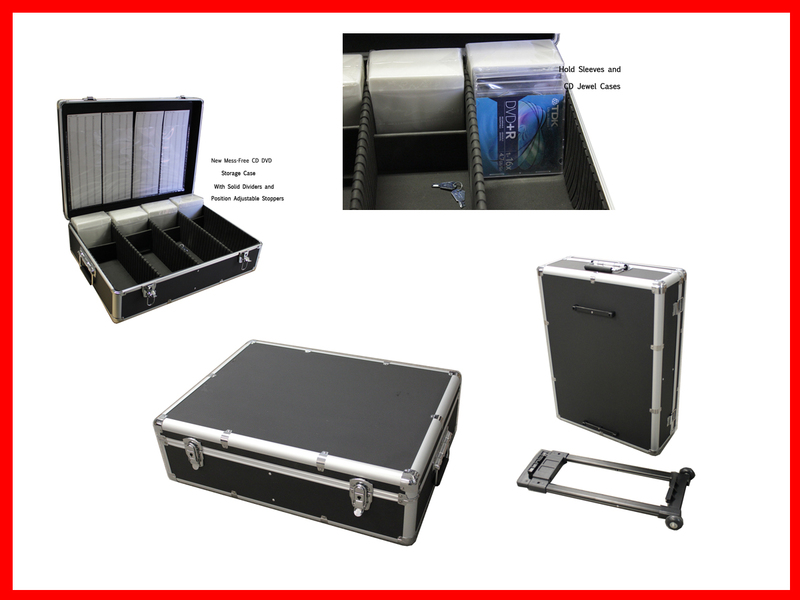 This rolling DVD case with Removable Trolley to allow easy carry and store CDs and DVDs, designed for DJ. Enlarged Index Page allow you easy to locate your collection. Stoppers position adjustable, use for separate your different media and squeeze the discs to prevent move or mess up when carry them. No need hanger sleeves, no worry about the plastic hanger broken. Removable divider ensure the case can be used as general storage box for Tools, home hardware and the small equipments weigh up to 40 Lbs when carry. Free shipping offer only for Mainland USA and Canada, No PO Box address please.